The Mako Networks 7550 Gateway is designed to provide a Internet gateway for large business offices, remote hub sites and general use where security is a high priority. This model comes in a version for an ADSL connections or for a Ethernet connection to a fibre network infrastructure. 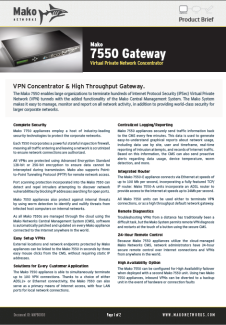 Dual Mako Networks 7550's provide High Availability (HA) fail over and restore automatically, without losing inbound VPN connections. Each version of the Mako 7550 Gateway is available in a lite and full version, supporting up to 100 users and 50 concurrent IPSec VPNs (lite version), or 250 users and 100 concurrent IPSec VPNs (full). Console management System ( CMS ) configuration and management via the Web, access from "Anywhere"
Download the Mako Networks 7550 bochure that contains a comprehensive statement of the technical specification, compliance statements and Awards - down load the pdf version by clicking the Brochure thumb print. The annual Fringe Festival in Edinburgh showcases some of the world's greatest emerging comedy talent. Underbelly�s revenue during the Festival, chipping in at least 50 percent of earnings. In each of these venues, it�s critically important for Underbelly to accept credit cards in addition to cash. Besides faster transactions, IP-based broadband can also offer significant cost savings versus traditional dial-up connections. For more information on the implementation of Mako Network Appliances at Underbelly Fringe Festival in Edinburgh.